Land Rover Day at the Mid-Suffolk Light Railway Wetheringsett tomorrow. Like we said before everything happens in June including Brandeston long weekend below. Tomorrow Peppery initiates the third Ipswich Jazz Festival with Italian band ♫Rumba De Bodas♫. Saturday in chronological order, Worlingworth Car Show, Playford Hall Open Day and in the evening and Aldeburgh Cinema Bill Nighie will do a Q&A after a showing of The Bookshop. Last night and tonight at the Fisher Theatre Bungay Monkey Business have a show of Cabaret, Circus and Burlesque for just £12. This weekend it's the Woolpit Steam Rally which in the Suffolk manner is held in Wetherden and tomorrow there's a jumble sale in Campsea Ashe and though we don't know where or what time the village hall seems an uncertain guess. Middy in the War Years tomorrow at Brockford Station Wetheringsett. JOB Mother of two with health problems seeks a Cleaner/PA in Great Finborough the other side of Stowmarket. We've added Detectorist Mackenzie Crook to peeps in Suffolk. Not wearing socks is enough to cause comment in Suffolk ... eh? ♫ Tomorrow night the Suffolk Singers present the concert Summer Serenade at Holy Trinity Blythburgh. All day today at Goodrich Park Palgrave (it's near Diss) Journey Through The Ages Vintage Rally and Country Fair. The Constabulary warn against a telephone scam claiming to be the tax office. It's six thirty pm and we're changing for dinner ... this may be Suffolk but do we look like we drive a tractor? Suffolk Young Farmers Country Fair this Sunday at Easton Farm Park ... they're a bit non-committal about what time it starts. It's the Suffolk Neighbourhood Watch Association annual general meeting tonight in Woolpit village hall, ample parking and refreshments. Laxfield Market is first Saturday of the month, Wenhaston Market is the last Saturday of the month, that's the 25th this month. Quite a wait for roller derby to arrive in Suffolk, now we're watching out for junior derby in East Anglia. There's been mutterings at Norfolk Roller Derby and it's reached Kent. The Norfolk and Suffolk photographs of Justin Partyka's were a feature of Mary Chamberlain's book Fenwomen when republished by Full Circle. The London gallery Osbourne Samuel are curating an online selling show Close to Home of his East Anglian works and running until 24th February. Around near the coast theatre companies are putting their Christmas shows together. In Fressingfield Sunday Roughcast Theatre were rehearsing a Christmas Carol with an impressive Marley's ghost and a live choir. The show goes on the road next month with visits to Huntingfield, Stowmarket, Hoxne, Southwold and Wingfield. Our link checker is starting to pick up the now defunct local web sites that chose not to pay One Suffolk and the village site that bizarrely now thinks it's 2015. Hay Fever is a Noel Coward comedy about a totally mad weekend house party in the 1920s. Last night's performance at the Bungay Fisher Theatre was beautifully costumed, had a very decent sized and appreciative audience and some the cast's ott business tempted applause mid-performance. Last chance to see tonight at the Pavilion Theatre Gorleston. Friday night the Open Space Theatre Company will be performing Ibsen's A Doll's House in the Wingfield Barns but regrettably we'll be in the Fisher Theatre Bungay snapping the Noel Coward comedy Hay Fever. ♫ We could tell you the Hank Wangford four piece including guest BJ Cole (Britain's master of the pedal steel guitar) are playing the Bungay Fisher Theatre this Saturday but it's Sold Out ... might be returns. If memory serves about the time PM Tony Blaire's vision for the information superhighway was to dole out rubbish computers in Framlingham the website One Suffolk arrived. An unlikely partnership between Suffolk's constabulary, county and district councils it provided free websites for community organisations, small business and parish councils, From next month Community Action Suffolk will be the new provider and they will charge for the service. If you're prepared to schlep to the Haverhill Arts Centre tonight for Shappi Korsandi's Oh My Country tour celebrating her forty years in the UK it's SOLD OUT ... except there are some single tickets ... so it's not SOLD OUT then. ♫ This may be a little ways off both in time and distance but looks terrific fun. The musical comedy Our House based on the songs of Madness and presented by the Waveney Light Opera Group in the Beccles Public Hall and the middle of next month. Before satnavs and in north Essex we stopped to ask the way and were told Go straight on at the T-junction ... how very Suffolk we thought. 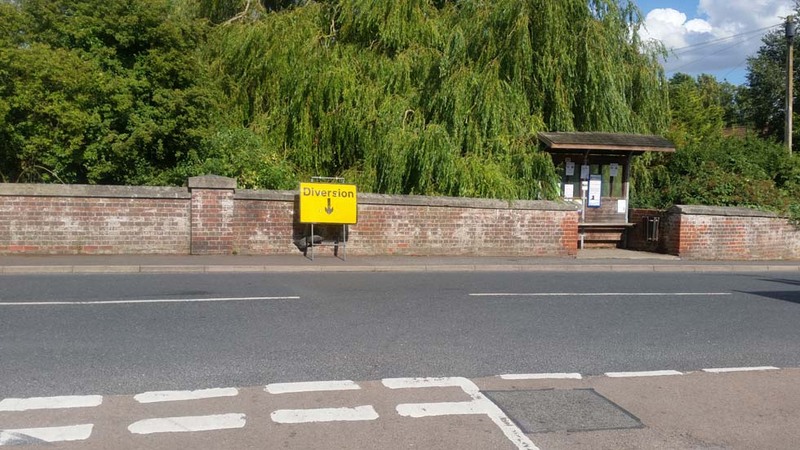 This diversion is in Debenham, pic by Tony Hutt. Don't know how long it's been there but we've only just noticed that BBC Radio Suffolk has appeared on Freeview channel 720. 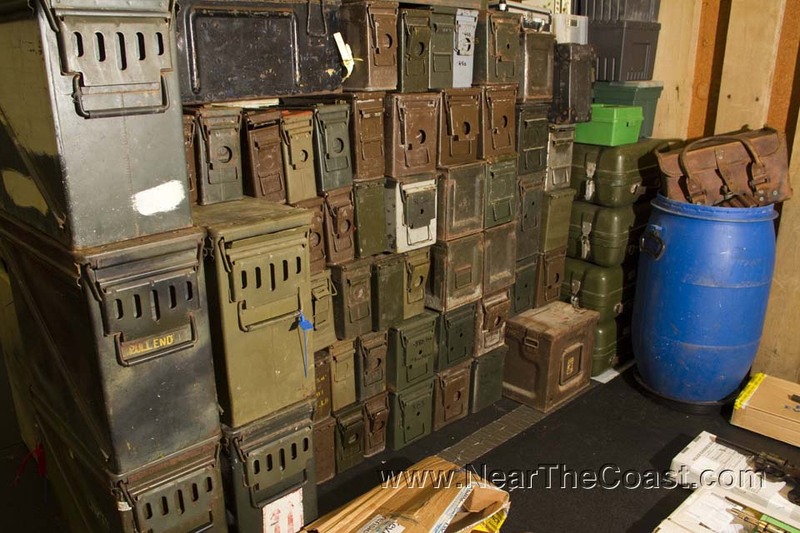 The bit of Suffolk not near the coast and in 2014. The coming weekend is the last of this year's Suffolk Open Studios. 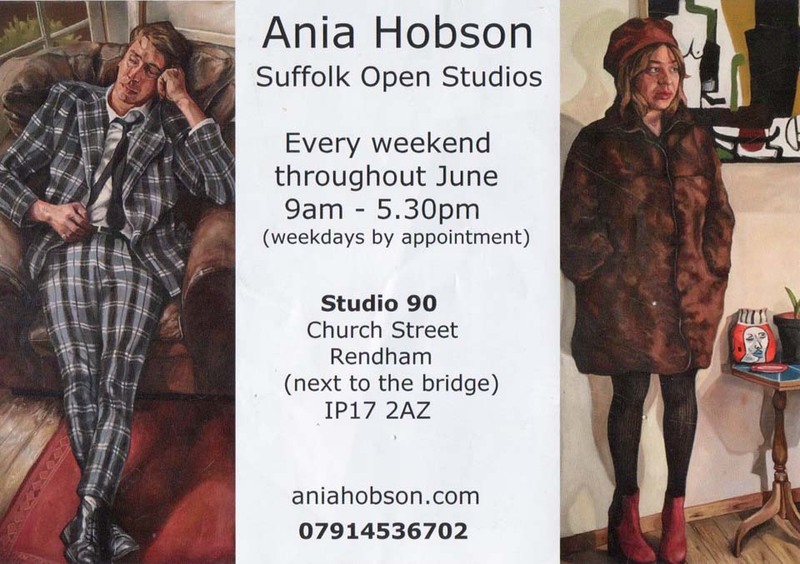 In Rendham Ania Hobson is open studio at Studio 90 newly opened in April this year. St Elizabeth Hospice Ipswich is hosting at Beccles Airfield a parachute party next month. They are looking for jumpers but on the day there will be entertainment including face painting, hot food, popcorn and music for spectators. The usual and lengthy police info for the Suffolk Show today and tomorrow. Things to do tomorrow should be vote for the Suffolk police crime commissioner (this year the candidates include two women and a green) and perhaps grab your last chance to register for the St Elizabeth Hospice 10th annual Midnight Walk. 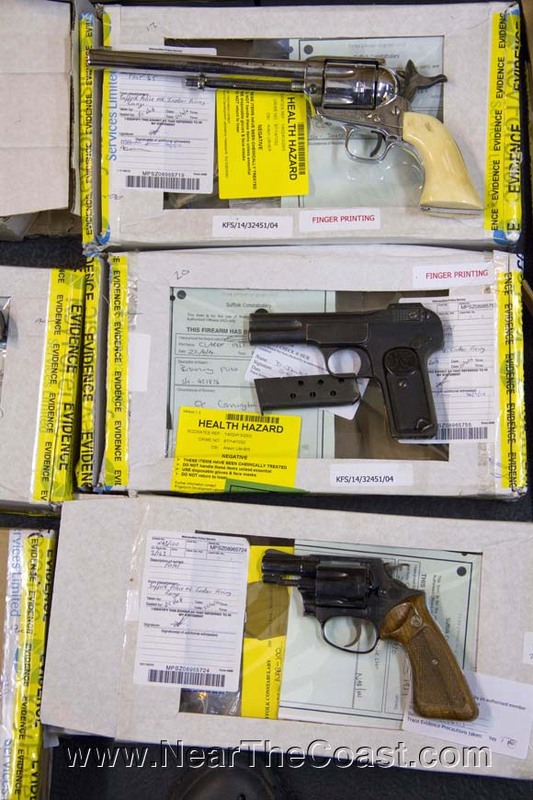 Police have named the Thurston teenager who died yesterday and confirmed that he died from an injury caused by an air pellet. Suffolk Young Farmers Country Fair tomorrow (the forecast looks better than today) at Easton Farm Park, not free admission but there are family tickets. We have a friend who grew up in Armagh. On a trip he and his father discovered that in Belfast fish and chips is served with fruit ... a slice of lemon. In a similar manner we have come to terms with fish and chips served with vegetables but went to pieces when in Long Stratton we were offered mint sauce with our mushy peas. We refused but next time we'll pluck up our courage and try. Overheard whilst waiting for a burger at Thetford rugby club He's eleven months, what would he want with a chip? Visited the Fisher Theatre Bungay last night for the first time yesterday to discover it's small but perfectly formed with loads of tech and you can take your drink into the auditorium. RoughCast Theatre were presenting the Victorian farce Charley's Aunt. Audience members inevitably asked Are you the official photographer? (No, we don't photograph officials) and then observed They're very good aren't they? ... can't disagree with that. Charley plays tonight in the Framlingham St Michael's Rooms. Tomorrow male roller derby in Ipswich. A Brit Champs double bouter with hosts Suffolk playing Nottingham and Bristol playing from Stamford Brawls of Steel. Tickets eight quid on the door or six online from Suffolk Roller Derby. Christies are already auctioning online properties and memorabilia from the James Bond film Spectre ... it is for charity though inexplicably none of the charities are in Suffolk or benefit cats, dogs, church roofs or trees. 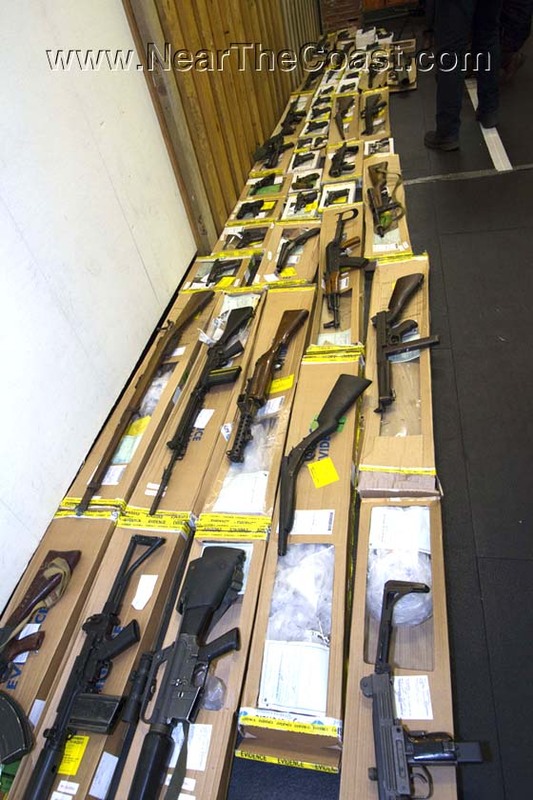 The thing about chairman of the parish council James Arnold's highly illegal 460+ firearms stash in Wyverstone (the other side of Stowmarket from near the coast) was the some 200,000 rounds of ammunition and other explosives. Kept in close proximity and a single room if there had been an accident there would have been a fireworks display the village wouldn't forget. 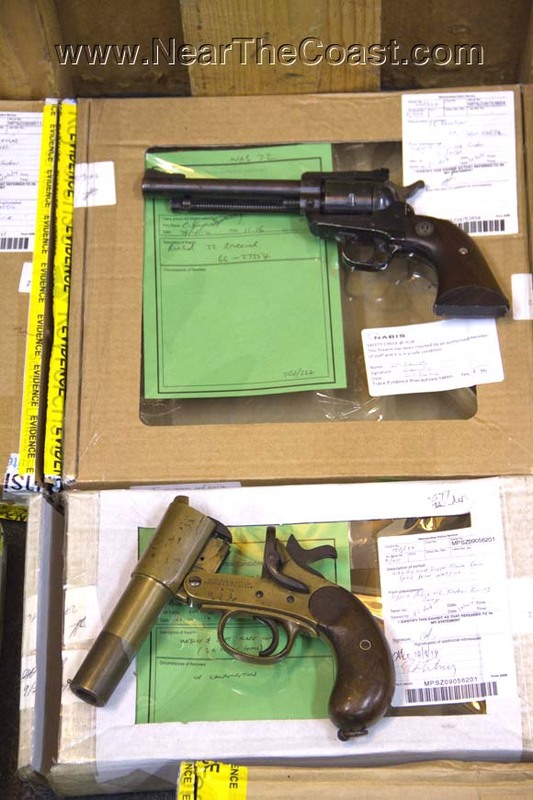 Arnold died of pancreatic cancer in July 2014 before he could face charges but last Friday following a related enquiry firearms dealer Anthony Buckland received six years for fraud and selling prohibited weapons. We like a guiding principle that's been pared down to a few words (Don't get involved Michael The Godfather) so much enjoyed Philthy Delphia's shouted Git It And Quit It to a lead jammer last Saturday. She was advising from the outfield the Norfolk Brawds B team in a scrimmage with Suffolk Roller Derby. The bout went both ways ending in a Brawds win. Rewardingly the scoreboard had the perception to keep moving about so everyone could see it. Thankfully no major injuries ... good stuff! Odd goings on between Halesworth and Bungay last month. The Harleston Players present starting tonight six performance of Treasure Island over the next two weekends. Suffolk Roller Derby held their first fresh meat of 2016 earlier this month at the Inspire centre Ipswich. We reckon there were 14 newbs ranging from ready to go to never been on skates before. New male and female faces always welcome Fridays but to ensure there's enough loan equipment it helps to contact them first.